Veteran southpaw Juanito Rubillar gets what he truly deserves – a rematch with IBF light flyweight champion Hekkie Budler who won the vacant title in a widely assailed hometown decision where all three judges were South African. Rodney Berman whose Golden Gloves Promotions will stage the rematch just as it did the initial title fight, assured that this time around only one South African judge will be included in the panel while opening the possibility of a Filipino judge also being appointed for the fight scheduled at Emperors Palace near Johannesburg on July 19. Berman said he had agreed with IBO president Ed Levine that it was best to “clear the air” after the previous bout. The promoter explained that they never intended to appoint three South African judges but claimed that one of the officials from Australia chosen by the IBO had visa problems and did not arrive on time. While the undefeated Budler started aggressively and took the early rounds, Rubillar fought back in the fourth and connected with a number of solid shots to the body as Budler backed off. Rubillar staggered Budler on a number of occasions and took control of the fight in the seventh round amd hammered the South African with solid hooks to the body and although Budler stayed on his feet he didn’t regain control of the fight. With the controversial win Budler improved to 14-0 with 5 knockouts while Rubillar who had fought for the world title in different organizations several times in the past but somehow always fell short, dropped to 48-14-7 with 23 knockouts. 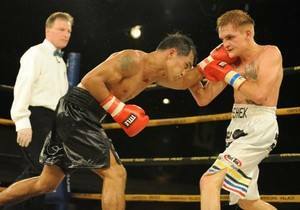 Top photo: Juanito Rubillar (L) and Hekkie Budler.